100 pages | 20 B/W Illus. Vacuum technology is widely used in many manufacturing and developmental processes and its applications grow in scope and sophistication. It is an inter-disciplinary subject, embracing aspects of mechanical, electrical and chemical engineering, chemistry, and materials science while having a broad foundation in physics. In spite of its technological importance, and perhaps because of its cross-disciplinary nature, substantial teaching and training is not widely available. Basic Vacuum Technology aims to give readers a firm foundation of fundamental knowledge about the subject and the ability to apply it. 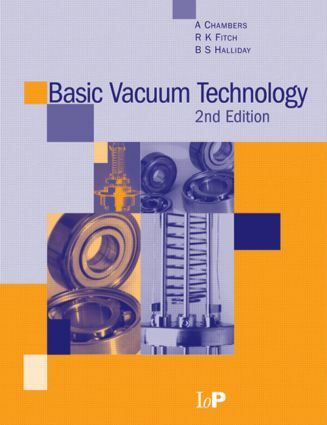 This book is an introductory text on how to use vacuum techniques. It provides a good grounding in the basic scientific principles and concepts that underlie the production and measurement of vacua. The authors describe how these are applied in representative low, medium, high, and ultra-high vacuum systems and explain the most important practical aspects of the operation of a large variety of pumps, components, and measuring instrumentation. The book introduces numerical methods for analysis and prediction of the behavior of vacuum systems in terms of the properties of their individual elements and enables readers to recognize and resolve problems with malfunctioning systems. "… a very useful text which is an up-to-date introduction appropriate to new research students so that they can approach UHV equipment with confidence." "…much useful information on gas behaviour and surface cleaning."